Wishing everyone a very happy Ganesh Chaturthi !! Modak is a sweet dumpling which is common in Western India.It is called modak in konkani,marathi and gujarati.The sweet filling inside a modak is made up of jaggery and fresh coconut.When the filling consists of chana dal along with coconut and jaggery it is known as puran.Puran stuffed modaks are known as Puranache Modak.The dumpling can be fried or steamed.The steamed version is known as Ukdiche Modak.Modak has a special importance in the worship of Lord Ganesh as modak is believed to be his favourite food. 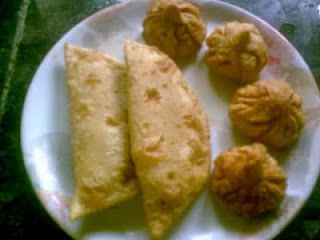 Along with modak another preparaton which is common amongst konkanis is nevri.It is known as karanji in marathi and gujia in hindi. Add salt to the flour and knead the dough using water(like that of chapati dough). Soak the chana dal for 5-6 hours in water(or overnight).Pressure cook the dal till soft. Add jaggery to it.Mash the cooked dal and then add it to the pan. After 2min add freshly grated coconut and then cardamom powder. Keep stirring this mixture till all the moisture is lost. The stuffing should be a little hard.This is known as 'puran' and its the same stuffing used in making puran-polis(use of coconut may be optional). Once the puran is ready(around 5-7min later) let it cool down for sometime. Make small balls out of the dough and roll them into small puris. Place some stuffing in the center and seal the edges to give it the shape of a modak. For the nevris- roll the dough into small rotis. Place the stuffing in the center and fold one side of the roti to cover it in a d-shape. The edge of the nevri can be given any shape you like. Similarly make rest of the modaks and nevris. Deep fry the modaks and nevris on a medium heat till golden brown.